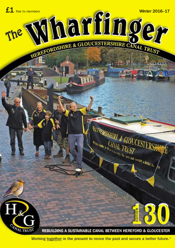 Members of the Trust receive our quarterly magazine, The Wharfinger which contains restoration news and updates of the many activities of the Trust. Contributors to the magazine come from all parts of the Trust. Their articles and photos reflect the enthusiasm and commitment to the restoration. The Winter 2016 Edition 130 magazine is now available with updates from the regular restoration teams across the two counties. Employees from Land Registry swap their desks for sunshine! Although Trust Members receive The Wharfinger for free, it is available for £1 + pp to non-members. The Wharfinger is also available to non-members for £1.00 + pp.